KEB DARGE AND LITTLE EDITH’S LEGENDARY WILD ROCKERS 4. A lot has happened to Keb Darge and Little Edith since the release of Keb Darge and Little Edith’s Legendary Wild Rockers 3, in June 2013. The village in the Philippines, where Keb Darge and Little Edith live, was destroyed by a typhoon. Nothing was heard of Keb Darge and Little Edith for several days. Some people feared the worst. Then came the news, Keb Darge and Little Edith were safe. They’d survived one of the most devastating typhoons to hit the Philippines. It had been a harrowing period for Keb Darge and Little Edith. Despite this, they were determined to compile Keb Darge and Little Edith’s Legendary Wild Rockers 4 which will be released by BBE Music on 7th July 2014. 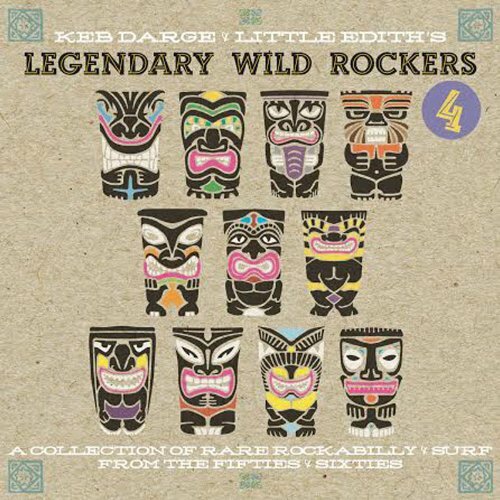 Keb Darge and Little Edith’s Legendary Wild Rockers 4 features twenty slices of rare rockabilly and surf. These tracks were released between 1956 and 1964. They’re a mixture of rarities, cult classics and hidden gems. That’s what we’ve come to expect from the Keb Darge and Little Edith’s Legendary Wild Rockers compilation series. The first instalment in Keb Darge and Little Edith’s Legendary Wild Rockers compilation series began in June 201. It was so successful, that it’s since become an annual occurrence. Keb Darge was born in Elgin, Scotland, and from an early age, was absorbed in music. His first exposure to music was as a record collector. Having accumulated an impressive record collector, DJ-ing was the next step for Keb. He travelled around Scotland and eventually, to Wigan. The road to Wigan was a well travelled road for Scottish soul fans. Most headed to the Wigan Casino, whereas Keb landed a DJ residency near the casino. He continued to DJ until he was twenty-two, then decided to move to London. After moved to London, Keb quit DJ-ing. Promoters persisted in asking him to DJ. Eventually, he relented, allowing London’s club-goers to experience the Northern Soul sound. Then disaster struck for Keb in 1987. His divorce saw him forced to sell his beloved record collection. Obviously, without records, a DJ-ing career wasn’t feasible. Heading out into civvy street, Keb tried various jobs to make ends meet. Then, when he rediscovered some records in his loft, this would change his career, and life. The pile of records that Keb discovered in his loft were what Keb called “junk records.” They included what was the beginning of what would become “deep funk.” Keb took this junk records to the Wag Club in 1989. Although this was the height of the Acid House’s popularity, the Wag Club was best known for Acid Jazz. After the night ended at The Wag Club, Keb met fellow DJ and record collector Snowboy. This was the start of a long and successful partnership. Snowboy and Keb transferred their deep funk night to another venue. Due to the popularity of house music, the night never gathered momentum. From there, they headed to Soho. This was the perfect venue. Their Legendary Deep Funk night became hugely successful. It was so successful that the new venue quickly establishing itself as a club. Keb continued to DJ at the Legendary Deep Funk night lasted until 2010, when he decided to quit playing Deep Funk. This resulted in a change of direction from Keb Darge. After moving away from Deep Funk, Keb continued to DJ. He changed direction musically, spinning an eclectic selection Northern Soul, rockabilly, early R&B and jump-blues. However, by 2010, Keb’s career was heading in different directions. Not only was he busy compiling compilations for various labels, but was running Kay Dee, a label he founded with Kenny Dope. By 2010, Keb Darge had compiled various compilations, including several volumes of his Legendary Deep Funk, plus Soul Spectrum, Funk Spectrum and Lost and Found with Paul Weller. 2010 saw the release of the first of Keb Darge and Little Edith’s collaborations. In 2010, Keb Darge and Little Edith released Keb Darge and Little Edith’s Legendary Rockin’ R&B. Then in 2011, came the first installment in Keb and Little Edith’s new compilation series. Keb Darge and Little Edith’s Legendary Wild Rockers was released in July 2011, with Keb Darge and Little Edith’s Legendary Wild Rockers 2 following in July 2012. Now just eleven months later, Keb Darge and Little Edith’s Legendary Wild Rockers 3. Given how critically acclaimed Keb Darge and Little Edith’s Legendary Wild Rockers 2 was, Keb Darge and Little Edith’s Legendary Wild Rockers 3 has a lot to live up to. No worries. Keb and Little Edith dug deep into his record collection. He came out with twenty of his secret weapons. The result was Keb Darge and Little Edith’s Legendary Wild Rockers 3, which managed to surpass the quality of the two previous volumes. However, after without doubt the most turbulent year of their lives, Keb and Little Edith return with Keb Darge and Little Edith’s Legendary Wild Rockers 4, which I’ll pick the highlights of. The most important track on any compilation is the opening track. Keb and Little Edith realise this. They open Keb Darge and Little Edith’s Legendary Wild Rockers 4 with The Black Albinos’ Shish Kebab. It was released on a single on the Belgian label, Newtown Records. For those unfamiliar with The Black Albinos, they’re a Dutch group. They released their first single in 1962 and the split-up in 1965. Nearly thirty years later, The Black Albinos made a comeback in 1994. One of their finest moments was Shish Kebab, a dramatic slice of surf garage. From the get-go, the Floyd Dakil Combo don’t spare the hooks on Dance, Franny, Dance. It’s a rockabilly track. Released in 1964, on Jetstar Records, Floyd Dakil Combo gave the Dallas based group a nationwide hit. Hook-laden and joyous, this was as good as it got for the Floyd Dakil Combo. They never again replicated the success of Dance, Franny, Dance. Ric Cartey With The Jiva-Tones released Young Love as a single in 1956. It was released on the Stars Inc. label. Tucked away on the B-Side is Oooh-Eeee. Written by Jerry Reed, this is a swinging slice of rockabilly that’s guaranteed to fill a dance-floor. Mike Waggoner and The Bops were a rockabilly from from Minneapolis, Minnesota. Despite recording a number of songs, the majority went unreleased. This includes a cover of Chuck Berry’s Bye Bye Johnny. The only single Mike Waggoner and The Bops released was Baby Baby. It’s a cover of a Dale Hawkins’ song, which was released in April 1961, on the Vee label. It sees Mike seems to pay homage to Eddie Cochran during a barnstorming version of Baby Baby. So it’s no surprise that three years later, Mike Waggoner and The Bops opened for The Rolling Stones in Minneapolis. Irresistible. That describes The Dazzlers’ Gee Whiz. It was released in 1958, on Lee Records. Gee Whizz bursts into life and The Dazzlers create a blistering slice of rockabilly. Sometimes, it reminds me of Chuck Berry’s 1956 hit Too Much Monkey Business. Just like Chuck Berry on Too Much Monkey Business, The Dazzlers storm their through Gee Whizz. In 1960, the Col-Lee-Jets released Phoney Baby as a single, on the Northwestern label. Tucked away on the B-Side was Jam and Jelly. It’s a driving, stomping slice of rockabilly. Stab of searing guitars and blazing horns play their part in this glorious hidden gem. Benny Joy’s Little Red Book bursts into life. Straight away, it’s obvious Benny Joy is a seriously talented singer. There’s a nod to Elvis. Maybe that’s why Sam Phillips offered Benny a contract with Sun Records? Incredibly, Benny turned down what for most singers, would’ve been the opportunity of a lifetime. He did go on to enjoy regional success. One of Benny’s biggest hits was Little Red Book, which he swaggers his way through. Another was Steady With Betty. It features an Elvis-esque performance from Benny Joy, where he’s accompanied by some searing guitar licks. Just like Little Red Book, Steady With Betty is a glimpse of what the man they called the Dark Prince of Southern Rockabilly was capable of. The Emanons released Stomper as a single in 1959. It’s one of the rarest tracks on Keb Darge and Little Edith’s Legendary Wild Rockers 4. Over the last couple of years, copies have been changing hands for well over $100. No wonder. It oozes quality. Stomper by name, it’s a stomper by nature. Even better are the scorching saxophone solos. They’re the finishing touch to this Stomper. It was back in 1959 that George Fleming released I’m Gonna Tell as a single. I’m Gonna Tell was released on the Fleming label. Then twenty years later, in 1979, the single was rereleased on Rollercoaster Records. On both occasions, Shake was the B-Side. Just like I’m Gonna Tell, Shake epitomises everything that’s good about rockabilly. Although the music is fifty-five years old, it’s timeless and will leave you wanting to hear much more rockabilly. Big John Taylor was Benny Joy’s guitarist. He also released Money Money as a single in 1959. From the opening bars, he unleashes his surf guitar. It plays its part in the track’s moody, menacing sound. Especially when combined with a grizzled saxophone. The result is one of the best instrumentals on Keb Darge and Little Edith’s Legendary Wild Rockers 4. Closing Keb Darge and Little Edith’s Legendary Wild Rockers 4 is Service With A Smile. This is the second single from Kuf-Linx. They’re joined by John Jennings. It was a double-A side. Eyeballin’ was the flip-side. Released in 1958, Service With A Smile is a fusion of doo wop and R&B. This marked a stylistic departure from their debut single So Tough. Of the two tracks, I much prefer Service With A Smile, with its fusion of smooth soul and doo wop. Keb Darge and Little Edith have surpassed themselves with Legendary Wild Rockers 4. It’s without doubt, the best instalment in their Legendary Wild Rockers’ compilation series. That’s incredible, given how traumatic a year it has been for Keb and Little Edith. They survived a typhoon that devastated the town they live in, in the Philippines. At one point, they were missing. As time went by, people began to think the worst. Then, just as a few people were beginning to abandon all hope, the word came through, Keb and Little Edith were safe. This was a big relief for everyone. After all, Keb is one of legends of London’s club scene. The founding father of Deep Funk, Keb changed direction in 2010. He began spinning a much more eclectic selection of music, including Northern Soul, rockabilly, early R&B and jump-blues. Then a year later, came the first instalment in the Legendary Wild Rockers’ compilation series. Since then, another three volumes have been released by BBE Music. Keb Darge and Little Edith’s Legendary Wild Rockers 4 is the latest instalment in the series. It’ll be released on 7th July 2014, on BBE Music. Every year, Keb and Little Edith somehow, manage to surpass the quality of the previous instalment in the Legendary Wild Rockers’ compilation series. This year, they’ve dug deeper than they dug before to find the rare rockabilly and surf that features on Keb Darge and Little Edith’s Legendary Wild Rockers 4. They’ve surpassed themselves. Keb Darge and Little Edith have combined cult classics, hidden gems, B-Sides and rarities on Keb Darge and Little Edith’s Legendary Wild Rockers 4, which without doubt, is the finest instalments in the Legendary Wild Rockers’ series. ← LITTLE MILTON SINGS BIG SOUL.